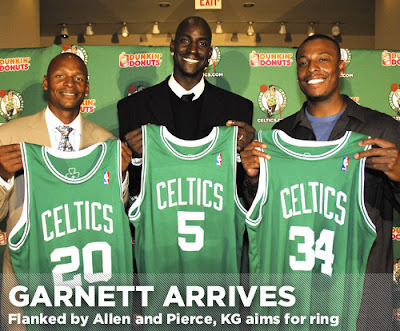 you go away for a couple of weeks and when you return the Boston Celtics have dona a mega trade and landed Monsieur Garnett. Suddenly the talk of the town and even getting press that rivals the Red Sox. They even have some TV time on next year american TV. The good news for me is that I will see the main man in action this October in the pre-season, so cool! For those that are confused, it means that the once hallowed franchise has a couple of years to shoot for another championship – something that is 21 years overdue. And it just may be possible that Reggie Miller may come out of retirement to join the party. We may achieve nothing but once again the great celtics are the talk of the town! Grew up in San Antonio, so I remember going to Spurs game during the ABA days. (barely) But the Celtics should be fun to watch again. certainly hope so. Only seen them twice in the flesh, in the 90’s so excited about the upcoming uk visit. Spurs have come a long way since those ABA days.